When Gotham City needs your little Batman, make sure he's fully prepared. Sure, the cape and the mask are important, but how is Batman supposed to pull off his sweet martial art moves without his trusty gloves? You'd be surprised how much Batman relies on his gloves when he's climbing pipes and karate chopping villains. Not to mention he never leaves fingerprints, which helps keep his identity under wraps. Your Batman is sure to get a grip now that he's got his gloves. The city will thank you for not cutting corners now that the Joker is behind bars once and for all. Whether the costume is for Halloween or playing pretend, when his Batman outfit is fully assembled you might have trouble getting him to turn back into plain old Bruce. Although he's sure to be pumped to have to full ensemble we can't promise that your child won't being begging you for some of that sweet bat technology next. We wouldn't blame him. 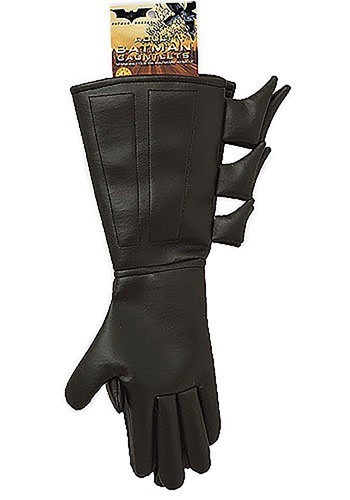 After all, these gloves would look sweet behind the wheel of the Batmobile.